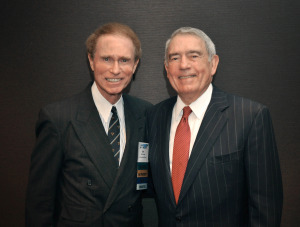 Famed TV news anchor Dan Rather (right) is introduced to an audience of close to 400 public relations professionals by Art Stevens. The occasion was the annual Big Apple Awards honoring the best public relations campaigns of the year. Rather was the keynote speaker of this event, which took place on May 24 at the Mandarin Oriental Hotel in New York. Art is a past president and board member of the sponsoring organization, the New York Chapter of the Public Relations Society of America. Among the companies singled out for best public relations campaigns of the year were American Express, IBM and Procter & Gamble. Rather talked about his new book Rather Outspoken: My Life in the News and recounted his long tenure as managing editor and anchor for CBS News.